When companies start to imitate one another, it’s usually either an extreme case of flattery—or war. In the case of Google and Apple, it’s both. They are merely 10 miles apart from each other in Silicon Valley and for almost a decade the two have been on good terms. Apparently, those times are now over. 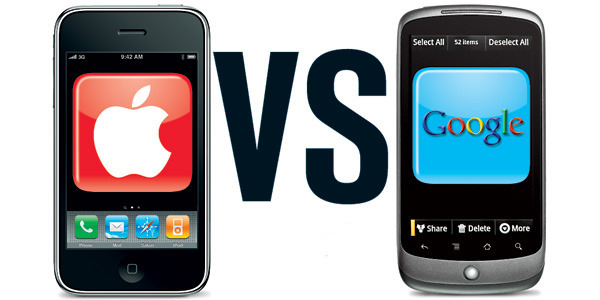 With the Nexus One, Goole enters the Hardware game – threatening Apples iPhone. Apple recently acquired Quattro Wireless – an upstart advertising company that excels at targeting ads to mobile-phone users based on their behavior. With this acquisition Apple not only aims to create completely new mobile ads, apparently, they want to make search on mobile phones obsolete. An attack directed at the heart of Google. In the next months the Apple-Google battle might get even much rougher. What happens if Apple decides to dump Google as the default search engine on its devices? This would be an obvious move as it would cut Google off from mobile data that could be used to improve its advertising and Android technology. Nevertheless, Apple needs search on the iPhone. This could even go so far that Steve Jobs could cut a deal with – gasp! – Microsoft to make Bing Apple’s engine of choice, or even launch its own search engine. Very interesting. Let’s see how this develops. PS: In case you missed it: Check out a prediction of mobile trends until 2020 – a look into the future of mobile. Google Developing Tablet to Take on iPad! ?